Business names on Facebook? Punctuation makes it a scam. Period. If you spend enough time on Facebook, you're pretty much guaranteed to see lots of posts from “like-farming” scam pages. Like-farmers start pages and fill them with content dedicated to collecting as many “likes” or “shares” as possible in the shortest amount of time, in order to drive up the page's popularity ranking. Once it's high enough, the like-farmer removes the original page content and replaces it with anything from scam advertising to dangerous malware infections. So when you see Facebook pages with such names as “Disney Land” or “Disney World” or “Walt Disney Land,” you can dismiss them as fake pages without even inspecting their content. Problem is, this particular scam-detection method only works if you already know the full, exact, trademarked name of a given business well enough to recognize a fake (and there are lots of non-Disney employees who understandably can't be bothered to keep track of the differences between Disneyland, Disney Land, Walt Disney Land, Walt Disney World, Disney World, and so forth). But there's an easier way to detect a scammy Facebook business page that requires no “name knowledge” at all: look at the page's business name to see if there's any punctuation. If there is, it's probably a scam. Last month, we warned you about a then-new like-farming scam falsely promising the chance to win Disney theme park tickets and thousands of dollars cash spending money for anyone who “liked” and “shared” a particular Facebook post. 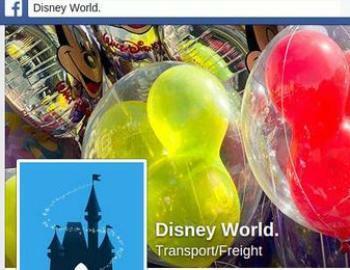 That scammy like-farming Facebook page went by the name “Disney World.” — with a period at the end of the name. Of course, the incorrect name and the unnecessary punctuation weren't the only signs indicating a scam page: the real Walt Disney World Facebook page is identified as a “Theme Park” in its cover banner, whereas the “Disney World.” like-farming page (which, at press time, hasn't been updated since that May 14 like-farming fertilizer promising bundles of cash and “all paid for Disney World Vacation[s]” to 75 lucky winners) identifies as a “Transport/Freight” company in its banner. Most obvious of all, the real Walt Disney World Facebook page is entirely filled with various forms of pro-Disney advertising: videos, photos and articles all hammering home the message “Look how much fun you could have, if you spent money here at Walt Disney World!” But like-farming pages only have posts offering valuable prizes if you like and share their content. A current search for Facebook pages going by the name “Disney World.” (two words followed by a period) shows over half a dozen different like-farms currently in operation: in addition to the “Transport/freight” page, there's “Disney World.” with a “Computers/Technology” banner, offering $5,000 cash plus Disney park tickets if you “like” and “share” their most recent post; “Disney World.” in the “Engineering/Construction” business offering $2,500 plus Disney tickets if you like and share; a Disney World-plus-period “University” (offering tickets plus $3,500); a “Food/Beverages” company (tickets and $2,000); a “Travel/Leisure” group (tix plus $5,000) and a “Community Organization” (ditto). You'll find similarly scammy offers on Disney-name variants such as “Disney-World.” (note the period and the hyphen). There's also such oddities as the “Walt Disney Land” page with a “Local business” banner which, as of June 18, has some fairly impressive statistics (27K people “like” this) and a page history dating back to 2010. Yet there's not a single post visible on that page, anywhere. How does a Facebook page collect over 27,000 “likes” without posting any content? It doesn't. What's happening is the “like farmer” has already stripped whatever posts he used to collect likes and shares – almost certainly posts promising the chance to win valuable prizes. Of course, Disney isn't the only company whose theme parks are used as like-farming bait. 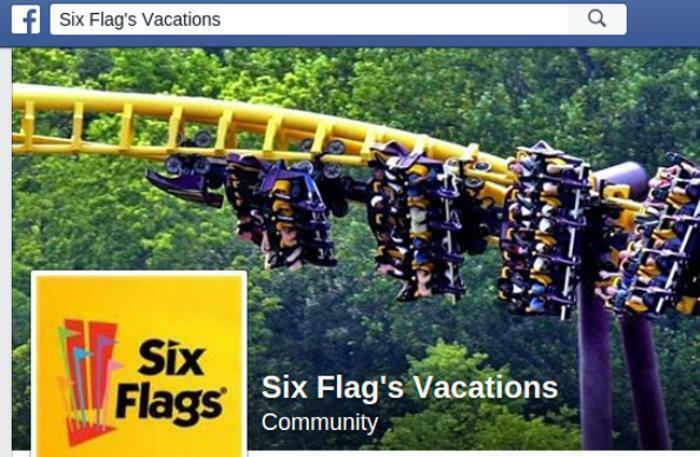 Six Flags is another whose legitimate Facebook page has many poorly punctuated like-farming doppelgangers. But in all such cases, the incorrect name or unnecessary punctuation was only the first of many signs that these are scammy like-farming pages; the main clue is the content. With any post you see on Facebook, remember that if you see such phrases as “Like and share if you agree!” or “Like and share to win a valuable prize!” there's almost certain to be a like-farmer behind the post.